Mount towel bars and rings at exactly the right height for the people in your household. Q: I’ll be remodeling my guest bathroom soon. What’s the best towel bar height? Does the same height apply to towel rings? A: With all the details that go into a bathroom remodel, towel bar and ring height can often fall by the wayside. 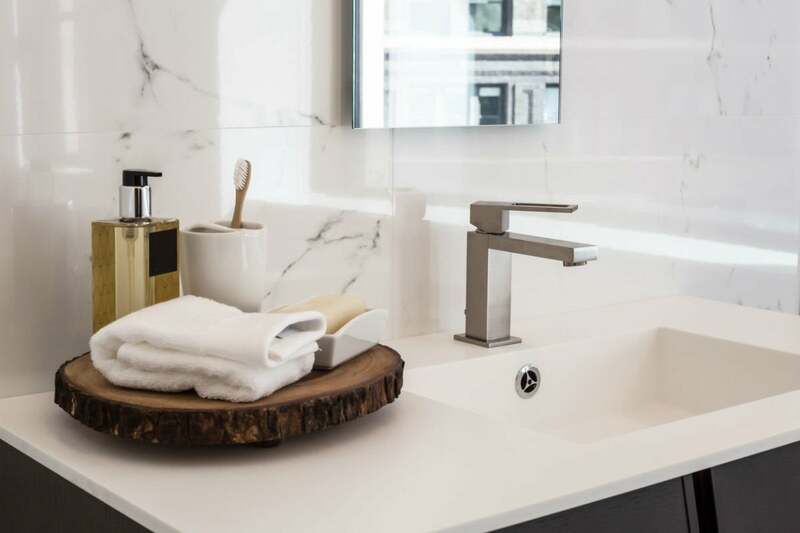 But where the bar lies on the wall dictates the speed and ease of your daily dry-off sessions and the cleanliness of your towels, so you’re smart to consider it now. The last thing you want is a too-low bar that lets towels drag on the floor and pick up bacteria or one that’s so high it makes removing and replacing towels challenging. 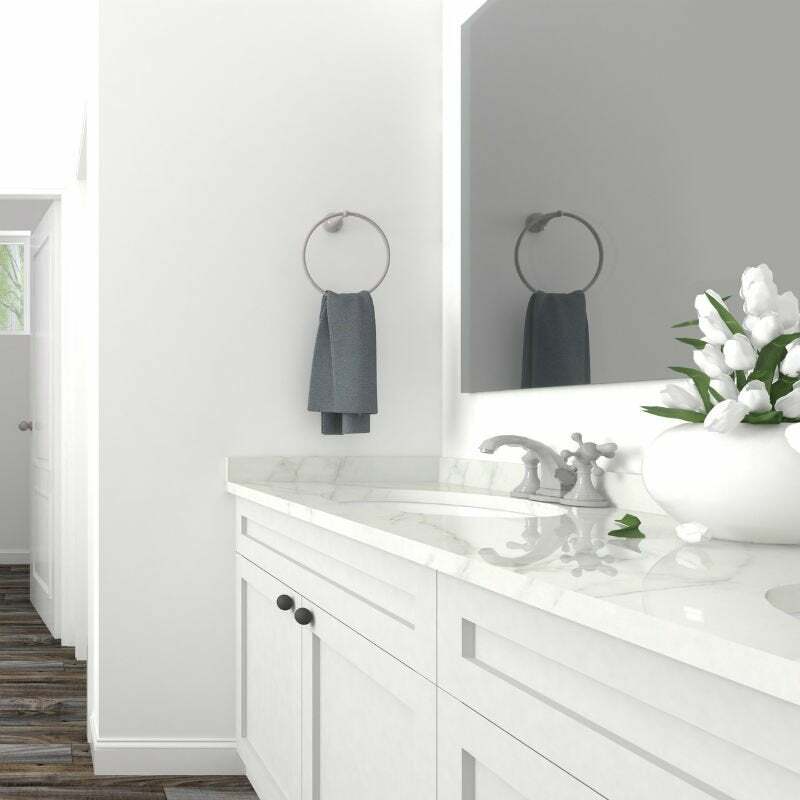 While there is an industry standard height that contractors tend to use, the best height depends on the bathroom layout and who will be using it. For example, if the bathroom is part of a mother-in-law suite, you may want to plan for aging in place by making it accessible for folks with limited mobility. Ahead, tips on optimizing the placement of towel bars and rings for utmost comfort and convenience. The standard towel bar height is 48 inches above the floor. A person of average height can quickly access it from a standing position with his arms comfortably outstretched. When folded in half widthwise, both average-sized (27-by-52-inch) and oversized (30-by-58-inch) bath towels will hang from the towel bar without touching the floor. If you want to mount a towel bar on a wall to hang over a vanity, it won’t be in the way of the vanity. Indeed, the bar will be located anywhere from 16 to 18 inches above the average vanity height (at 30 to 32 inches above the floor). When folded widthwise, an average hand towel (from 16 x 28 to 18 x 30 inches) or washcloth (13 x 13 inches) will also hang at this height without touching the top of the average vanity. Lower the height to 44 inches to accommodate those with limited mobility. These height guidelines will allow people of limited mobility in your household to retrieve a towel while seated in a wheelchair. Lower the height to 36 inches for little ones. If accessorizing a bathroom shared with or exclusively used by children, choose a towel bar height based on their ages. and no higher than 44 inches for 9- to 12-year-olds. These heights will allow most kids to comfortably grab a towel from a standing position without having to stand on tiptoes and to replace the towel themselves. Leave a two-inch clearance to the floor and other bars when stacking multiple towel bars. If you plan to install one towel bar above another, first determine the height of the lower bar. Measure the length of the largest towel you intend to hang on the lower bar when folded widthwise, and add two inches for clearance so the bottom of the towel won’t touch the floor. For example, assume the largest towel you’ll hang is 58 inches long (29 inches folded widthwise): 29 + 2 = 31, making 31 inches the height above the floor to mount the lower bar. To get the height of the upper towel bar, add the lower towel bar height plus two inches of clearance between the lower towel bar and the bottom of the towel hung from the upper towel bar, plus the height of the largest towel you want to hang on the bar when folded widthwise. For the example above: 31 + 2 + 29 = 62, making 62 inches the height above the floor to mount the upper bar. Leave a four-inch clearance between towel bars and outlets or switches. Electrical outlets are most commonly installed at a height of 16 inches from the floor to the top of the outlet, but you’ll encounter some GFCI outlets installed above the bathroom countertop. Light switches are also commonly installed 48 inches above the floor. This means that, in a small bathroom, an existing outlet or switch may prevent you from mounting a towel bar at the standard towel bar height. If this is the case, adjust the towel bar height to at least four inches below the base of the obstructive outlet/switch. Tip: Avoid installing a towel bar directly above an outlet or switch; water from wet towels can run down the wall and seep into these receptacles, potentially causing a short circuit. Use the standard towel bar height as a reference to determine towel ring height. A towel ring, generally used for hand towels, consists of a circular band suspended from a mount. While the bottom of the ring, from which the towel hangs, sits at a height of 48 inches above the floor, the mount sits higher on the wall. To determine the height at which to mount the unit, measure the distance from the bottom of the ring to the center of the mount, add that figure to 48, and then measure and mark the total distance up the wall to determine the towel ring mounting height. For example, if you measured six inches from the bottom of the ring to the center of the mount, you should install the mount of the towel ring 54 inches (48 + 6) above the floor. 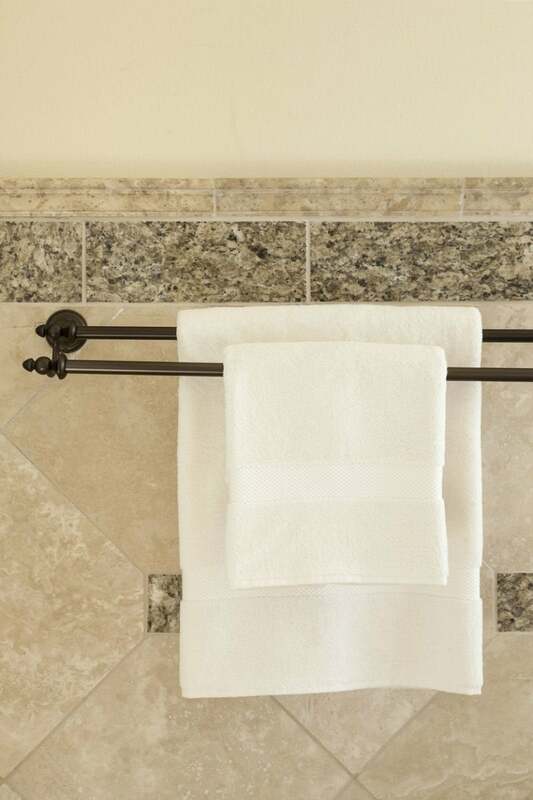 Choose towel bars that are long enough to accommodate your towels. Towel bars are commonly sold in lengths of 18, 24, and 30 inches. Factor both your bathroom and towel size into your decision of which of these lengths to choose. Eighteen- and 24-inch-long towel bars are the most space-smart choices if you have an average 40-square-foot bathroom. But a 30-inch-long towel bar is also an option in a 45-square-foot or larger bathroom where space is less of a concern. If you plan on hanging bath towels, which range from 27 to 30 inches wide (13.5 to 15 inches when folded lengthwise), opt for an 18- or 24-inch-long bar if you want to fit one towel, or a 30-inch-long bar to fit one unfolded towel or two folded lengthwise. If you want to hang hand towels that are 16 to 18 inches wide (eight to nine inches folded), choose an 18-inch-long towel bar to fit one unfolded towel or two folded lengthwise or a 24- or 30-inch-long bar to fit three folded towels. You can choose an 18-, 24-, or 30-inch-long bar for a towel bar for washcloths, which are usually only 13 inches wide (6.5 inches folded). Towel rings come in a variety of sizes, usually no more than eight inches in diameter, which will fit a washcloth or a hand towel, but is neither large nor strong enough to hold an average bath towel.